A Company is an association of persons who share common goals. Moreover, the owners of the company pool their resources in order to achieve their common goals. 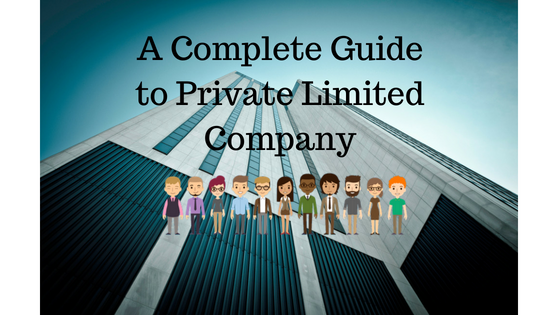 A private limited company is a closely held company with restriction to issue shares to the public. Thus that it cannot go for an IPO or list their shares on the stock exchange for public trading of their shares. Registration of a Pvt Ltd Company in India is regulated by the Companies Act, 2013 and administered by the Ministry of Corporate Affairs. 3) prohibits any invitation to the public to subscribe for any securities of the company. Turnover as per last profit and loss account does not exceed two crore rupees or such higher amount not being more than twenty crore rupees. Note: None of the above is applied to a holding or subsidiary company. A Private Company becomes a “small company” if the paid-up share capital does not exceed fifty lakh rupees and its average annual turnover during the relevant period does not exceed two crore rupees. There must be at least two Promoters and at least two Directors. Promoters may be individual or body corporate who will promote/incorporate a company and Directors should be individuals. The individuals need to apply for DIN i.e. Director Identification Number in Form DIN 1 along with the prescribed documents. Digital Signature is a must for any of the two Directors. There are total seven Certification Agencies authorized by the Controller of Certification Agencies to issue the Digital Signature Certificate. Next step involves application to the concerned Registrar of Companies (ROC) along with the prescribed documents and fees. The promoter can apply for six company names amongst which the ROC will approve only one. If the ROC rejects all the names, the applicant has another two chances to apply the name again with the same fees he has incurred. After the name approval, the drafting of Memorandum of Association and Article of Association are drafted by the Directors/Promoters. To know more read: MOA and AOA, its importance for the company and its members. Many start-ups register as a ‘Private Limited Company’ as it is the most preferred form of entity for seed funding by Vc’s and investors. It is thus the most popular form of business entity in India. Read why is a Private Limited company more suitable for Startups who want to go for seed funding. One can start the Pvt Ltd company, with the minimum of 2 members and maximum of 200 members as per the Companies Act, 2013. Minimum 2 directors are required for Pvt Ltd Company. Directors and the shareholders can be the same person. No mandatory qualifications are required for the appointment of directors. For Pvt Ltd Company, share capital of only Rs 1,00,000 is needed. The prospectus is a detailed document issued by the company which invites the public for the subscription of shares, debentures of a company. The issue of a prospectus is not required in Pvt. Ltd. Company. Statutory meeting of the members or filling of Report to the Register of Companies is not required. In the Pvt Ltd Company, shares cannot be easily transferred unless other shareholders approved it. The public is not allowed to buy the shares of Pvt Ltd Company. Every private company should have to mention “Pvt. Ltd” at the end of the company name. Appointment of Auditor Auditor will be appointed for the 5 years and form ADT-1 will be filed for a 5-year appointment. The first Auditor shall be appointed within expiry of one month from the date of incorporation of a private limited company as given in the incorporation certificate. Statutory Audit Every Company shall maintain its books of Accounts and get the same mandatorily audited by a Chartered Accountant in Practice holding a COP at the end of every FY. The Auditor shall prepare an Audit Report annexed with Financial Statements audited by him for the purpose of presenting it in the AGM and filing it with the Registrar of Companies. Filing of Annual Return (Form MGT-7) Every Private Limited Company is required to file its Annual Return within 60 days from the date of holding the Annual General Meeting. Annual Return will be period beginning 1st April and ending 31st March i.e Financial year. Form AOC-4 – Filing of FS Every Private Limited Company shall file the financial statements namely Balance Sheet, Profit and Loss Account annexed with Director’s Report after they are adopted by shareholders in the AGM. Filing of adopted financial statements must be done along with form AOC-4 and prescribed fees within 30 days of holding of Annual General Meeting. Holding Annual General Meeting It is mandatory for every Private Limited Company to hold an AGM and lay down its financial statement along with Director’s Report before the members. Every company registered under the Companies Act, 2013 is compulsorily required to hold an AGM before the expiry of 6 months from the end of that FY. Preparation of Directors’ Report Directors’ Report will be prepared with a mention of all the information required under Section 134. For more information and consultation get in touch with our experts. Just fill a simple format Company Registration Online. What is the difference between Private Limited, Section 8 & Nidhi Company?